It’s rather rare that battleships are named after the minister that first proposed them. But such was the case of the Ammiraglio Di Saint Bon. She was the first of a couple of capital ships designed in opposition to previous battleships, seen as too costly and too complex. The goal was to create medium size battleships better suited to present Italian needs (and government funding!). Admiral Simone di Pacoret Saint Bon died however and was replaced by Admiral Benedetto brin as head of the navy. Basically Admirals Brin and Di St Bon tested various innovations on previous ships, which were rather large, perhaps over-engineered, with heavy guns. However, the government decided this time to emit some precise specifications and mandated a 10,000-long-ton (10,000 t) simpler design. Admiral Di Saint Bon commenced working on the design, but because he passed out, Benedetto Brin took succession and bring in some changes. 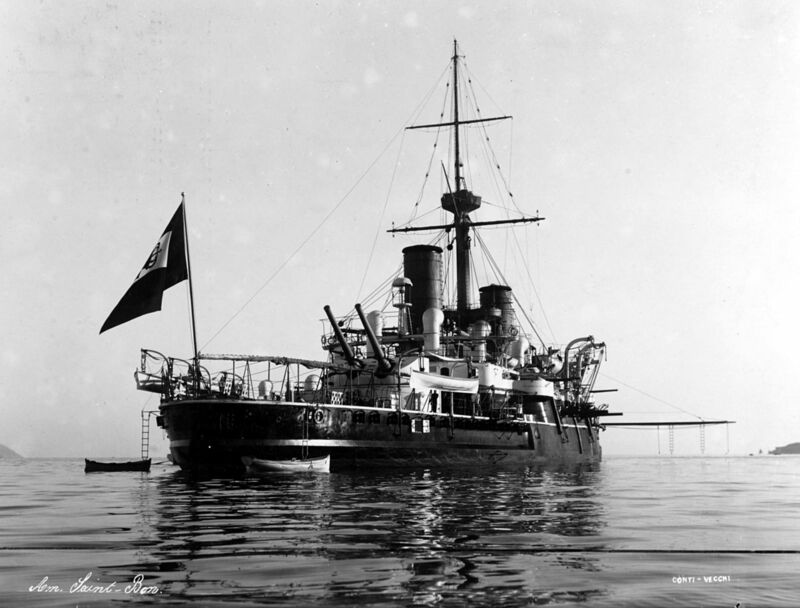 The ships named Admiraglio Di Saint Bon (posthumously) and Emanuele Filiberto, were launched at Venice Naval Shipyard and Castellammare Naval Shipyard respectively in 1897, but completed in 1902, after almost nine years. 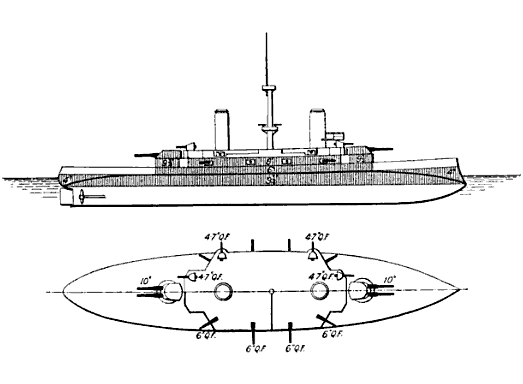 However, it was realized afterwards that both ships were undergunned and not particularly useful to the navy and the design was never repeated. On the following Regina Margherita class the tonnage limit was ditched and the Navy came back to a more standard approach. These ships were consequently smaller at 111.8 meters (367 ft) long for 21.12 m (69.3 ft) wide and a max draft of 7.27 m (23.9 ft), all for 9,940 long tons of displacement fully loaded. These ships received two triple expansion steam engines capable of 13,522 ihp (10,083 kW), fed by twelve coal-fired cylindrical water-tube boilers. This procured a top speed of 18.1 knots (34 km/h; 21 mph) as design for a 5,500 nautical miles (10,200 km; 6,300 mi) operational range at 10 knots (19 km/h; 12 mph). Both ships were given Harvey steel, with a main belt 9.8 in (249 mm) thick, 2.75 in (70 mm) thick deck, 9.8 in thick conning tower and 9.8 in thick plating for the main battery gun and 5.9 in (150 mm) thick for the casemates. The ship was designed to carry four 10 in (254 mm) 40-caliber guns in two twin gun turrets, forward and one aft on the main deck (no forecastle). A light armament that was equivalent to the British armoured cruisers main artillery but inferior to the standard of the time (305 mm). Secondary armament comprised eight 6 in (152 mm) 40-cal. guns, which again, was not impressive. Each was posted in individual casemates amidships. To deal with quick torpedo boats she also carried six 3 in (76 mm) 40-cal. guns in shielded pivot mounts. They were mounted above the casemate battery. Also, this was completed by eight quick-firing 47 mm (1.9 in) guns in simple pivot and various upper locations. 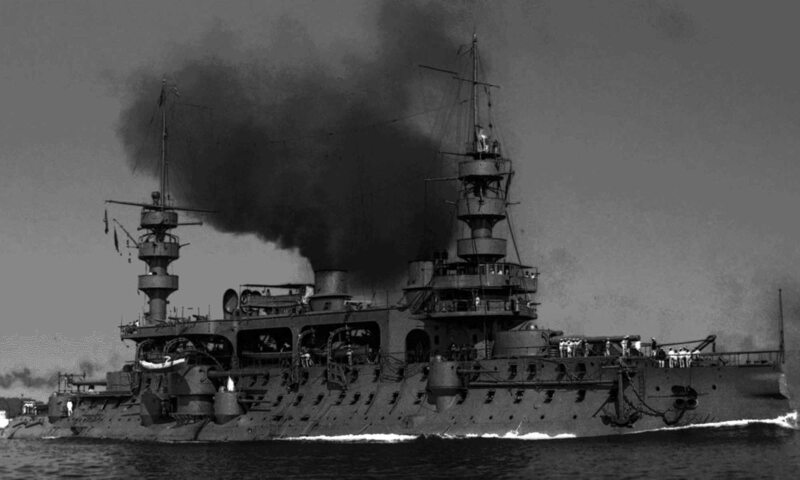 Each of these battleships also carried four 17.7 in (450 mm) torpedo tubes, on surface launchers. 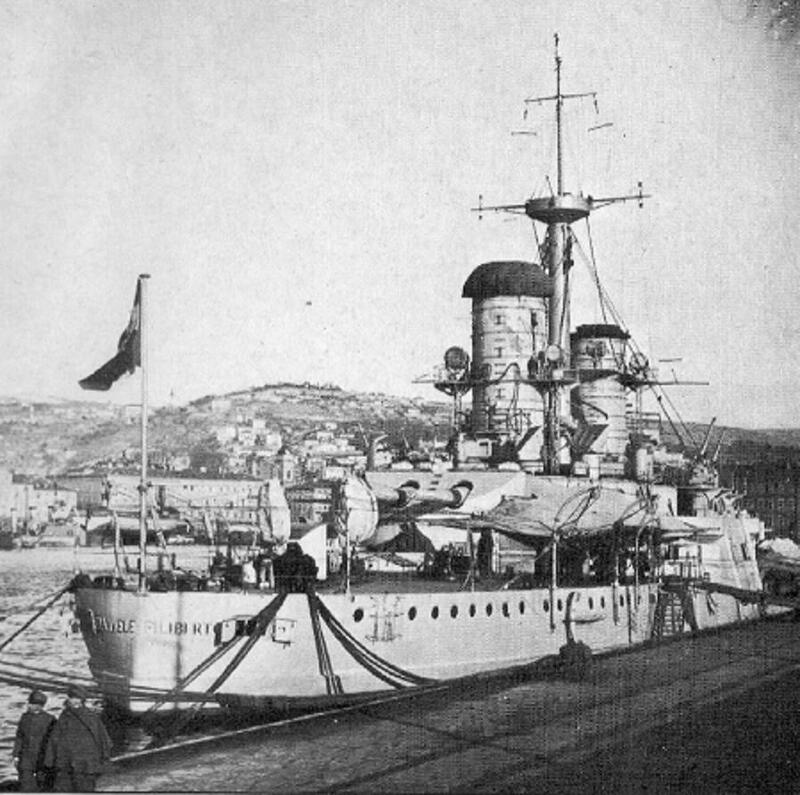 Despite their late entry into service and weak characteristics, both ships were still in need and after years of training and exercises, both ships took part in the Italo-Turkish War of 1911–1912 and actively in WW1. The Di Saint Bon was commissioned on 1 February 1901 but completed officially in May. For years she was part of the 1st Squadron, with Emanuele Filiberto and the two Regina Margherita-class battleships, taking part in many exercises like the 1906 fleet maneuvers in the Ionian Sea and again in 1908, and taking part in mock attacks on both sides. When on 29 September 1911 war erupted with the Ottoman Empire on the question of Libya, the Di St Bon was part of the 3rd Division of the 2nd Squadron, then joined another unit. She was not involved in African operations, but sailed from Tobruk to the Aegean Sea joining the 1st Squadron, taking part in the squadron which cut cables between Imbros, Tenedos, Lemnos, Salonica, and the Dardanelles. She also shelled Ottoman coastal fortifications of the Dardanelles. On 30 April 1912 she escorted a convoy between Tobruk and Rhodes. She then returned to Italy for changing worn-out equipment and after peace was signed, she received six searchlights on platforms abreast the funnels and mast, and a rangefinder was installed on top of the conning tower. In 1913, she took part in an international naval demonstration in the Ionian Sea to protest the Balkan Wars. Under British Admiral Cecil Burney’s international fleet she blockaded the Montenegrin coast. 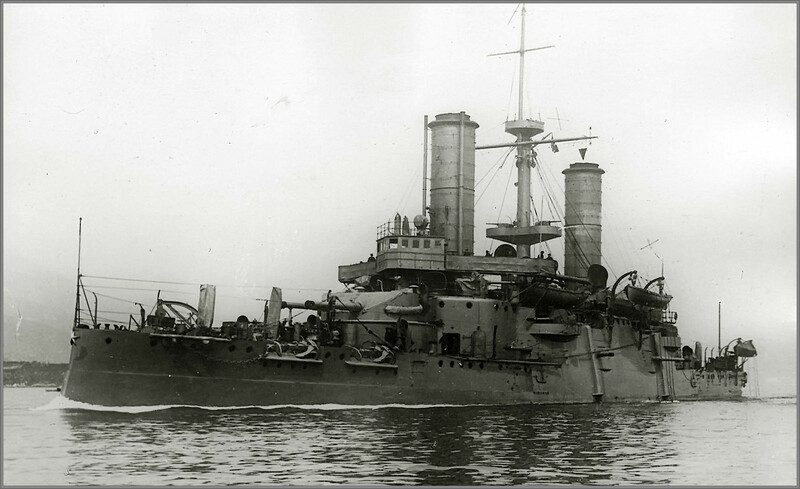 Both ships had been scheduled for disposal in 1914-15, however when the war erupted, both were kept in active service. 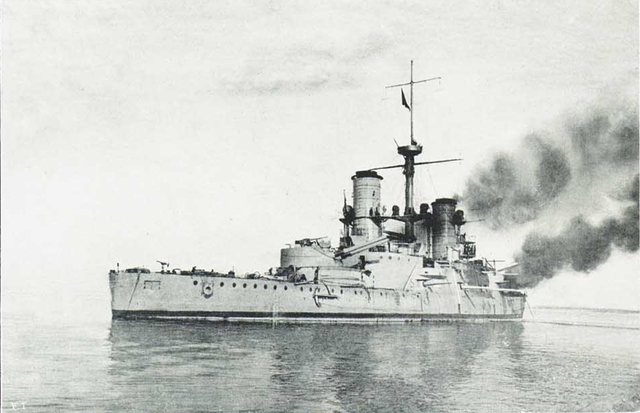 In July 1915, under command of Admiral Paolo Thaon di Revel, she was initially thought to be deployed for a blockade of the Adriatic sea, but ultimately was kept in reserve in case of an Austro-Hungarian main battle fleet sortie. She served as an harbor defense ship in Venice and from April 1916, as a floating anti-aircraft battery until November 1918. She was stricken in June 1920, and sold for scrap. Her career was similar to the Di Saint Bon in her early years, taking part in large exercises and maneuvers, and she served in the Italo-Turkish war with 3rd Division, shelling Tripoli among others. She also sailed from Tobruk to the Aegean Sea and took part to the fleet that cut the submarine telegraph Turkish cables between the Islands. She stormed the port of Vathy, destroyed the defences and sank an Ottoman gunboat. On 30 April 1912 she escorted a convoy bound to Rhodes and covered the landing area. She remained generally inactive as an harbor defense ship in Venice until the end of the war. In 1918 her aspects had somewhat changed however. 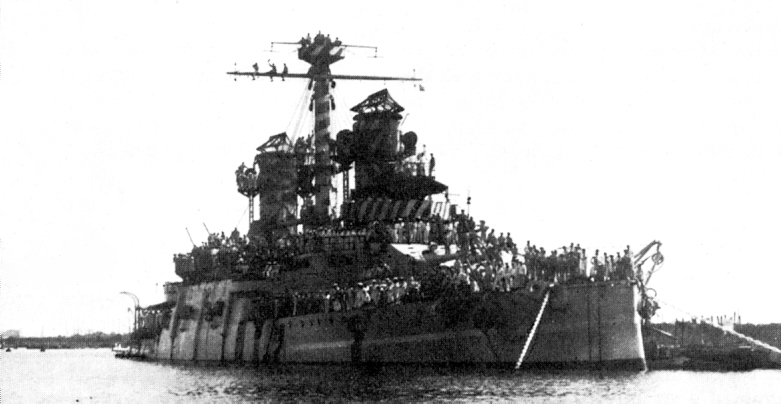 She has been camouflaged, with dark stripes, reduced mast, and cage tops over the funnels (See photo below), perhaps as a protection against lucky hits by enemy strafing planes.